Located at the heart of campus to powerfully symbolize the central nature of science and mathematics in the university's polytechnic curriculum, the Warren J. Baker Center for Science & Mathematics opened for classes in fall 2013. The 189,000-square-foot building, the university’s second largest after the Kennedy Library, is home to the chemistry, physics and natural resources management and environmental sciences departments. The likeness of Albert Einstein sits at the entrance to the main lobby on Level 2. "Albert," as he is affectionately called, is always ready for a photo, especially with people sitting next to him. Donated by alumnus Paul Bonderson, Albert has been adorned with scarves and even Rush T-shirts on occasion. The building's design goes hand-in-hand with Cal Poly's concept of learn by doing. 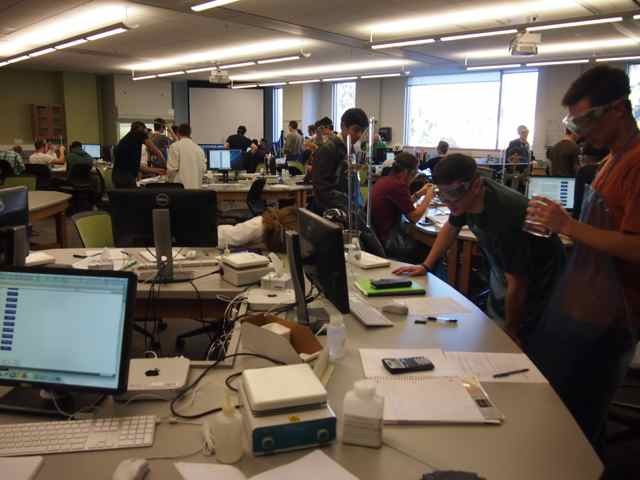 Ample study spaces -- enough to accommodate 400 students at a time -- encourage teamwork and close student-faculty interaction; advanced instrumentation rarely available to undergraduates fills the labs; and studio classrooms integrate lecture and lab, allowing students to actively discover science. The integrated studio classrooms, totaling four, are home to a variety of general chemistry courses. About 1,000 students per quarter can be accommodated in this pedagogical format. 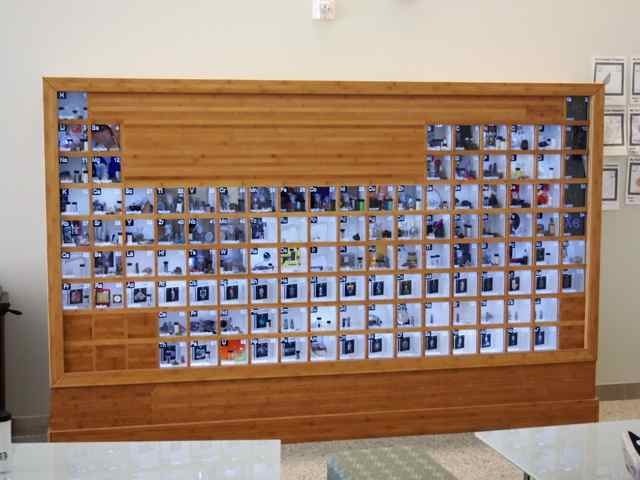 A Periodic Table graces the 3rd-floor lobby. The table contains both samples of the elements as well as examples of their applications in the world.